EuropeNewsExhibition : Michael Najjar – Who Gave Us The Sponge To Wipe Away The Entire Horizon? Following on from Miao Xiaochun in the Aljub gallery, this summer the Es Baluard Museum of Contemporary Art presentsa solo exhibition of works by Michael Najjar, the internationally renowned German artist whose work focuses on key elements of our modern society driven and controlled by computer and information technologies. The futuristic aesthetic of his works interrogates the social transformations wrought by science and technology, and pursues utopian and philosophical reflections through complex thematically linked work series. 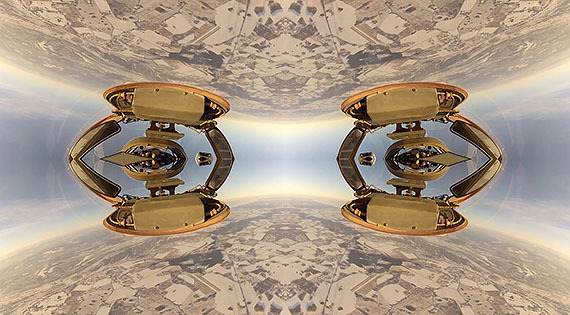 Since 2011 Najjar has been engaged on his outer space series dedicated to cutting edge developments in space travel and space exploration. 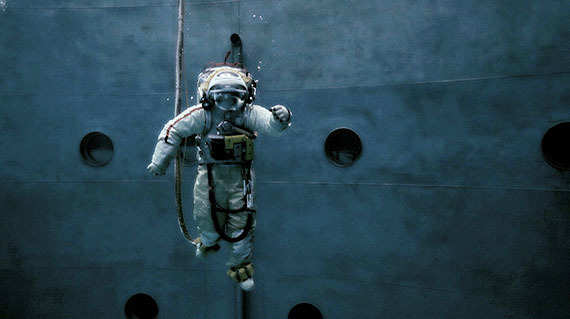 The exhibition presented at Es Baluard shows various chapters and situations from Najjar’s extensive astronaut training for his own space flight which will form a key part of this current series. 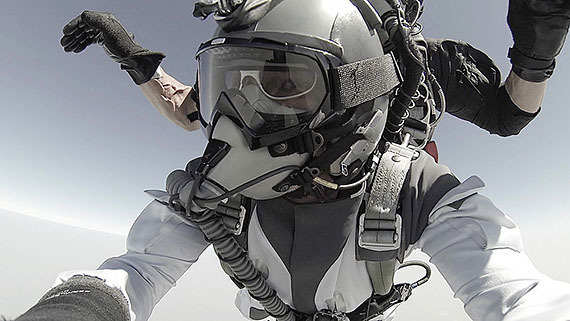 His three video works equilibrium (2013), spacewalk (2013) and skyfall (2015), now shown for the first time in Spain, range from a supersonic flight in a MiG-29 and a HALO (High Altitude Low Opening) jump from a height of 10,000 meters to the depths of a massive hydrolab in Russia’s Star City. Taxing his physical strength to the limit, Najjar places himself in extreme hostile (and even life-threatening) situations to create videos of high aesthetic quality that astonish viewers and raise questions about the different poles of existence – life and death, time and space, the beautiful and the repulsive. In the supersonic flight, the high altitude jump and the diving routine, Najjar acts both as a conceptual artist who meticulously prepares his storyboard and as a protagonist deploying his own body in the performative action. Born in 1966 in Landau (Germany), Najjar lives and works in Berlin. His work has been exhibited innumerous museums and art centers around the world, including the ZKM Museum für Neue Kunst, Karlsruhe, Germany (2015, 2013); MAMM- Multimedia Art Museum Moscow, Moscow (2014);the LABoral Centro de Arte y Creación Industrial, Gijón, Spain (2014); the Borusan Contemporary, Istanbul (2013); the Centro de Arte Alcobendas, Madrid (2011); the Gem Museum for Contemporary Art, The Hague (2011, 2008); CAC- Centro de Arte Contemporáneo de Málaga, Spain (2010); TEA- Tenerife Espacio de las Artes, Santa Cruz de Tenerife, Spain (2010);the New Media Art Institute, Amsterdam, Netherlands (2009);the Es Baluard Museu d’Art Modern i Contemporani de Palma, Palma de Mallorca (2008);the Biennale di Venezia-10th International Architecture Exhibition, Venice, Italy (2006); the 9 Bienal de La Habana, Havana (2006); and the Fundació Joan Miró, Barcelona, Spain (2004). His work forms part of public and private collections such as those of the ZKM Museum of Contemporary Art, Karlsruhe, Germany; the Museum Ludwig, Cologne, Germany; the CAC- Centro de Arte Contemporáneo de Málaga, Spain; the Deichtorhallen Hamburg: House of Photography, Hamburg, Germany; TEA-Tenerife Espacio de las Artes, Spain; DA2. Domus Artium 2000, Salamanca, Spain; the Grazyna Kulczyk Foundation, Poland; the Museo de Bellas Artes, Santander, Spain; and the Colección Pilar Citoler, Spain. lsruhe, Alemania; Museum Ludwig, Colonia, Alemania, CAC- Centro de Arte Contemporáneo de Málaga; Deichtorhallen-International House of Photography, Hamburgo, Alemania; TEA-Tenerife Espacio de las Artes; DA2 Domus Artium 2000, Salamanca; Grazyna Kulczyk Foundation, Polonia; Museo de Bellas Artes, Santander y la Colección Pilar Citoler, España.